Since 2008, I’ve donated thousands of hours of my time to help bring San Francisco it’s first bike park. Through my role as Co-Chair of the McLaren Bike Park Founders, I’ve done everything from project management and trail building, to logo design, social media admin, event planning, fundraising, community organizing, co-leading community meetings, and lobbying officials in San Francisco City Hall. Right now, I’m working with my Co-Chair Will Aldrich, our non-profit fiscal host, SF Parks Alliance, Alpine Bike Parks, Theresa Zaro Landscape architect, and SF Recreation and Parks, to develop construction documents that will go out to bid in August. We’re set to break ground in December of 2016. In 2004, I moved from Chicago to San Francisco for a new job at DDB, but also to pursue my passion for mountain biking, and my 10 year old son’s blossoming BMX racing career. I arrived in SF, the birth-place of mountain biking, hoping to find a wealth of cycling opportunities within riding distance of my front door, but surprisingly, it was slim pickings. In fact, cycling off-road seemed taboo, especially the gravity-style of riding that my son and I craved. We drove to BMX tracks in Napa and Santa Clara now and again, but the drives were brutal. Do, every weekend, we found ourselves heading South to nearby Pacifica and a Carlmont, where we could ride and build trails, jumps and stunts with impunity. We began to travel the country racing mountain bikes and riding whatever trails and bike parks we could find. 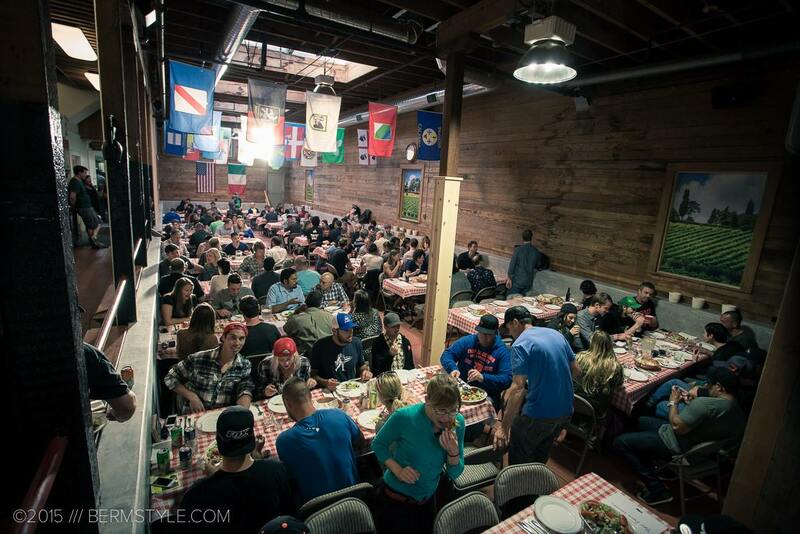 After riding and racing mountain bikes in the bay area for a few years, I became very connected with other cyclists and bike industry personnel. After a year in San Francisco, we bought a home on Mount Sutro in the Forest Knolls neighborhood. Soon after, I heard that there were trails being built just up the hill, and they were to be multi-use (hikers and bikers). I jumped in, helped build trails and connected with a group called SF Urban Riders. Then, SFUR consisted of about a half dozen riders who wanted more trails in the city, and a few that were interested in building San Francisco’s first bike park. Thanks to my design and marketing capabilities, I quickly became a part of the core group. I attended training, was certified as a trail crew leader, and began doing volunteer trail work on a weekly basis on Mount Sutro, in San Bruno, Marin, and on the Peninsula. I made a load of good friends and in 2008, and teamed up with a few like-minded individuals within SF Urban Riders to push the bike park agenda forward. Tom Borden and Mitch Monroe were two key members who were into the same style of riding I was, and had the same undiluted goal: Bike Park. As we dove deeper into the realities of a bike park in SF, we realized that this wasn’t going happen quickly, and many believed it would never happen at all. San Francisco is politically complex, with a variety of user groups, community organizations and special interests that battle for every scrap of ground in the city. Faced with almost insurmountable challenges, our group became more focused on trail-building. With the continued development of Mount Sutro, we could get our hands dirty and saw tangible results. As goals changed, some of the group fell away from the project and SF Urban Riders completely. Others moved away and found places to ride in their new towns and neighborhoods. Some key SF Urban Riders members supported the project half-heartedly, and out of necessity because it gained the group notoriety. It seemed almost impossible, but it was popular. It gave us talk value. And something tangible to raise money for. Regardless of the distractions, there were still a few of us who’s primary goal was a bike park. So, we continued to press on and look for a location. We first eyed Golden Gate Park. Golden Gate Park is the gem of San Francisco, and we found out quickly, virtually untouchable to any sort of development. So, we looked elsewhere for a location and discovered McLaren Park, San Francisco’s second largest park. Our small group engaged McLaren Park area community groups in conversation, held bike repair days in the park, and attending street fairs in the surrounding neighborhoods, setting up bike obstacle courses for kids. We led “Take a Kid Mountain Biking Day”, and began engaging with SF Recreation and Parks showing them how cycling can get kids active and be a positive outlet for kids, not just a destructive vehicle in the city’s natural areas. If we could get kids off the couch, and bikes off the native grasses, it was a win. 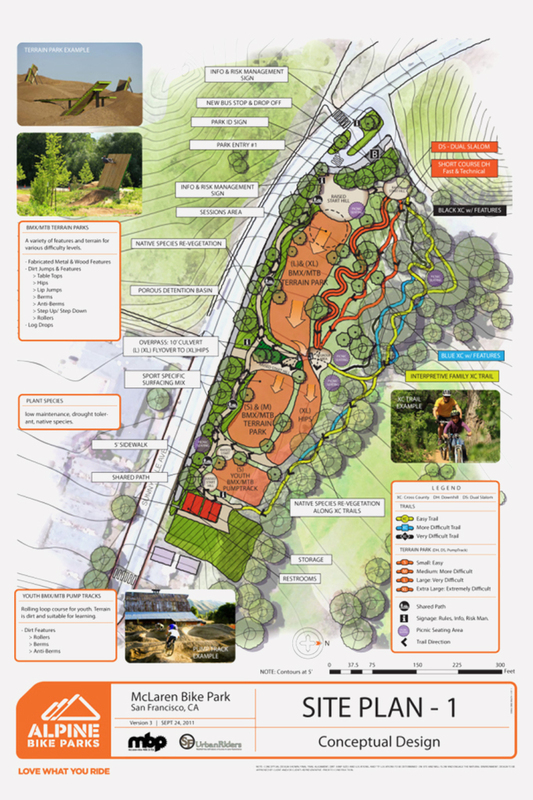 We began working with bike park design team, Hilride, on a proposal for McLaren Bike Park. I’d built some trails, jumps and stunts, but I’d never designed a bike park. Out of necessity, I created a rough design of the proposed park with all the features the cyclists of SF wanted. It had a bit of everything, for everyone. Key for me and my son was a short track Downhill course, and Slalom course. Over the next year, we honed our proposal and the language we used in public about the bike park. In early 2010, we started a petition of supporters and garnered hundreds of signatures and letters of support. In March, we presented at SFRPD’s McLaren Park planning meeting and turned out more supporters than any other user group. Results of an SFRPD conducted survey were presented and thanks to our outreach, the most requested amenity was a bike skills park. 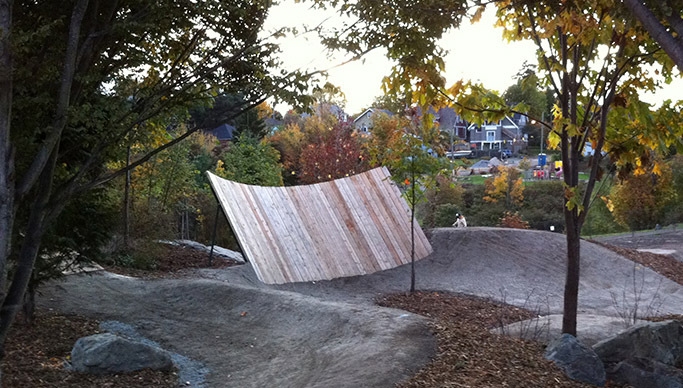 In October of 2010, we built a pump track at the SF Bike Expo to show the community what a bike park could look like. We spent over three weeks with about a dozen volunteers building a pump track that would only be ridden for a day. On November 6th, Hundreds of kids and adults swarmed the pump track and showed their support for MBP. For every SF Bike Expo ticket sold, we were to receive $1, but the biggest benefit of the day was seeing the flow of kids with smiles on their faces. And finally working together as a team to build a “prototype” of the thing we were working to make permanent in San Francisco. It gave us confidence, and a case-study to prove that a bike park would be valuable to SF Recreation and Parks. We sold shirts at the event, our first MBP shirts, with the logo I’d designed. On November 16th, the San Francisco Recreation and Parks Department held their first community meeting to discuss the possibility of a bike skills area in McLaren Park. SF Urban Riders, myself and then Executive Director, Dan Schneider, presented this deck outlining the need, user groups and answering the big question: What is a bike park? We also discussed the potential location of the bike park. Space is at a premium in San Francisco, so finding a spot for the bike park was no easy task. The area we discussed is a neglected area just outside Glen Eagles Golf Course along Sunnydale Ave. There was some opposition to the location as a community garden has been discussed for years, but there had been no forward movement. Only two people spoke on behalf of the garden. But they spoke loudly, and we would have to work with them in the years to come. In all prior planning meetings, multiple members of our group would stand in public comment, and talk about the benefits of a bike park. This was the first time a Bike Park had been on the agenda for any meeting in the city, and a huge step toward the realization of the first bike park in San Francisco. Throughout 2011, we lobbied local officials and community groups for their support. Some representatives attended our meetings. Others sent letters of support. A pivotal point in the project was receiving a letter form District 11 Board of Supervisors Member, John Avalos. Another key letter was received from SFRPD General Manager, Phil Ginsberg. Other leaders and community groups would follow and support the project. To gain community support and ownership, SFRPD required us to have a series of three community design meetings that gathered feedback on the project and it’s design. We enlisted Alpine Bike Parks out of British Columbia and bike park designer, Judd De Vall to help with the process. We worked with Alpine to create multiple design concepts that would be “tested” and commented upon throughout the meetings. 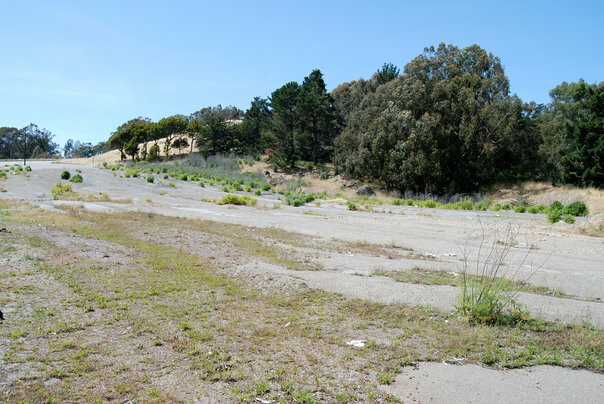 In July of 2011, in partnership with SF Recreation and Parks, we held McLaren Bike Park Community Design Meeting #1. Designed to make the project feel collaborative and “Designed by the community”, this process took through the end of 2011 to complete. By November, we’d completed the process, and had yielded a conceptual design the community supported. Until now, we’d won a few small grants of $100o to $5000 from bike-related companies to cover our relatively small expenses. To expand the scope of fundraising to the public as well as larger donors, I started a campaign called “The Founders Club”. Those who donated NOW, when the bike park was still just an idea, could get their name on a plaque when the park was ultimately built. This bit of risk would get them some substantial recognition for as little as $100. Something that would cost 100 times the amount if the park was in construction. The campaign kicked off slowly but gathered momentum and we raised over $15,000 in 2012, which funded the writing of our second application to the Community Opportunity Fund Grant. We had been unsuccessful in applying in 2012, but in January 2013, we struck gold and won the grant for $250,000. The COF Grant made us eligible for other grants, so shortly thereafter, we worked with SFRPD and Alpine Bike Parks to apply for a grant from The Land and Water Conservation Fund. The LWCF Program provides matching grants to States and local governments for the acquisition and development of public outdoor recreation areas. In July we were awarded an LWCF grant for $249,835, bringing our total funds raised to almost half a million dollars!!! Adding to the momentum, in September, over 300 racers participated in the McLaren Short Track Challenge at the SF Mountain Bike Festival where SFUR raised over $5000 for McLaren Bike Park. 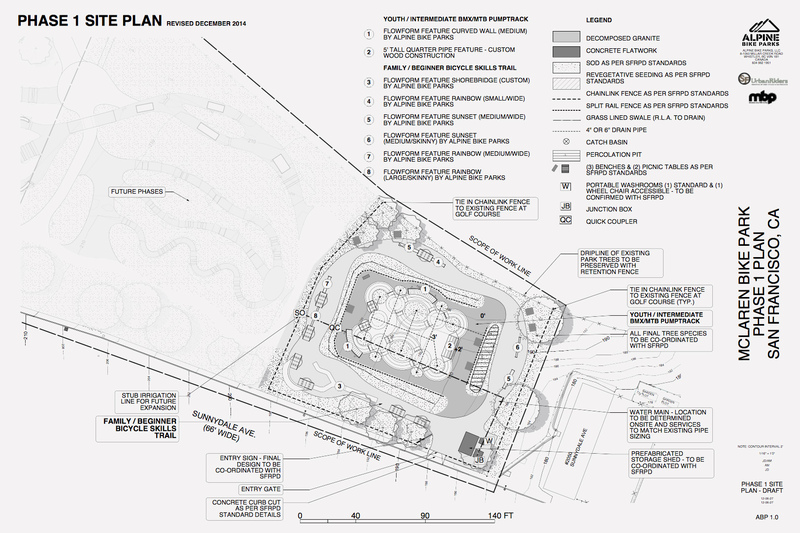 To insure that the bike park would be designed by a reputable designer, SF Urban Riders and the McLaren Bike Park Committee decided to fund the design portion of the project with donations. This avoided the design project going to the lowest bid through the city. Initially we thought we’d need to raise around $50,000, but we soon realized that we’d need to raise over $100,000 in design fees. Fundraising through the rest of 2013 and 2014 was a major hurdle. SF Urban Riders was becoming more fragmented in it’s goals, and no one got involved in the project to beg for change. So, progress slowed. But, there was still progress. 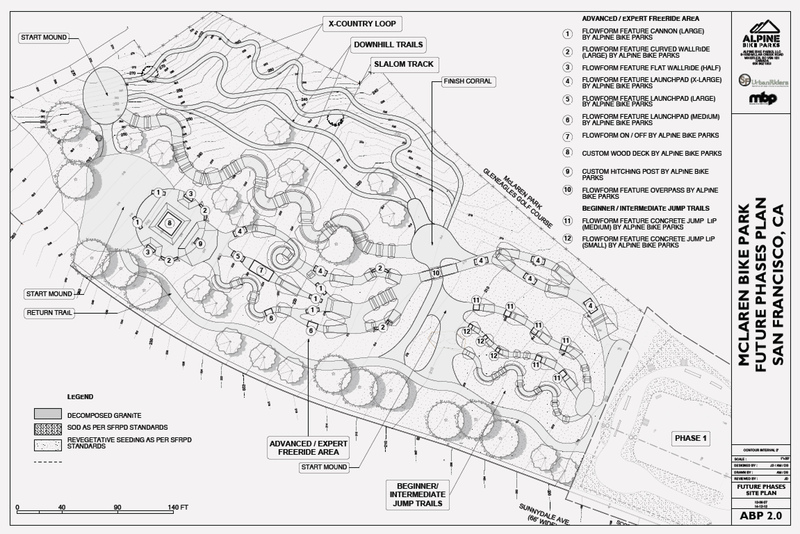 In December of 2014, I managed to grab an interview with Cam McCaul, professional mountain biker, and Alpine Bike Parks design consultant, as he and Judd De Vall, owner of Alpine Bike Parks discussed the design of the park. I managed to buy a Sony Alpha 7 camera on the way to the bike park location. I learned how to use it on the fly, and even with the factory battery charge, a bit of wind noise and my elementary editing skills, the resulting video proved to be a valuable asset in the fundraising effort. The natural slope, rocks and amount of space approved for McLaren Bike Park are appealing to designers like Alpine Bike Parks as they provide a great canvas to integrate man-made features like jumps and ladders into the riding experience. Alpine has enlisted professional riders like Cam to help plan the the location of the features in the park to maximize the space and flow. We continued to fund the conceptual design phase via Founders Club donations and grants from the Hellman Foundation and Mr. And Mrs. Caroline Gretsch. But, the next phase of design, which consists primarily of creating construction documents, set to begin in April required an additional $50,000 in funding. 2014 proved to be a tumultuous year. The second SFUR led McLaren Short Track Mountain Bike Race, got great reviews and press, but lost money. And the focus of the group had become fragmented. 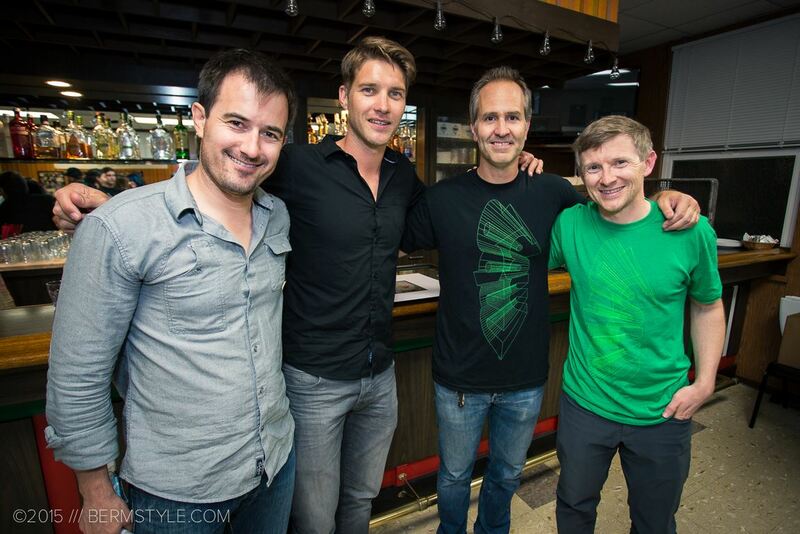 So, a few of us agree to split off and form a team solely focused on McLaren Bike Park called the MBP Founders. SF Urban Riders would focus on trail advocacy. We would continue to be hosted by SF Parks Alliance, who was SF Urban Riders non-profit fiscal host, but we would be a separate entity who’s sole purpose was to deliver a bike park to the children of San Francisco. Throughout 2014, The McLaren Bike Park Core team worked with the landscape architect and Alpine Bike Parks on cost estimates for phase 1, and outlining exactly what our $500,000 in construction grants will build. We took what we learned and dove into the details of Phase 1: Intermediate level pump track and family skills trail. 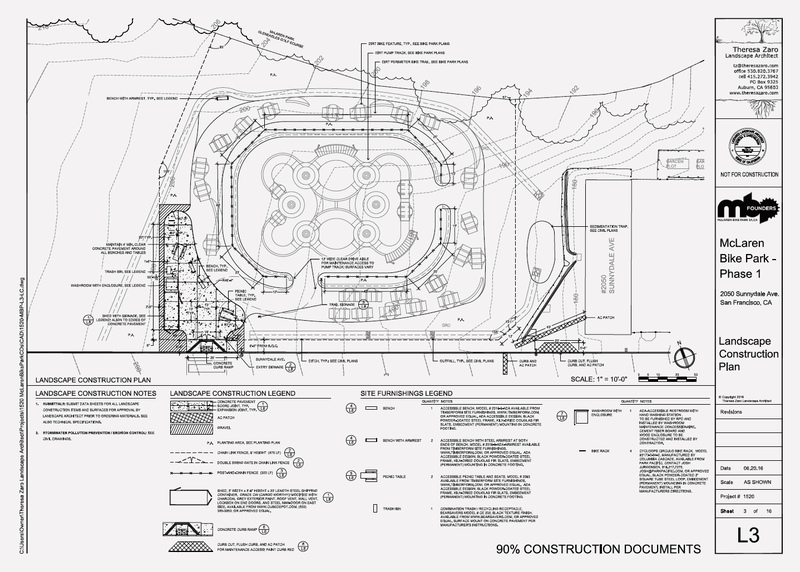 This plan showed an extra level of detail, and prepared us to move ahead into construction documents or “CD’s”. The space for phase 1 will utilize .75 acres of the four acre site, leaving over 80% of the space for future phases. Since the construction grants are not specified to fund design, we also continued to raise design funds. In total, we’d raised over $55,000 in grants and Founders Club donations for design, which would fund the project up to late April of 2015, when we’d begin creating final construction documents. Phase 1 will consist of an intermediate pump track and family/beginner skills loop with loads of fun features that will appeal to MTB riders and BMXers of all ages and skill levels. The pump track will dip approximately three feet below the surrounding concrete flatwork and riders will be able to drop in from anywhere around the outside. It creates a good roll in area for the park that will maximize terrain capacity. The pump track is being built on an existing slope so the final depths of the bowl will be determined in the CD process. The goal was to maximize the number of turns and pockets within a relatively small area.The way it is designed, there are lots of lines to choose from, and lots of opportunities for gaps and transfers. — Judd De Vall, Alpine Bike Parks, Principal Owner. The round rollers within will be like “volcanoes” with a rolled top allowing you to hit them in any direction. The berms at the top of the quarter will tie to the quarter like hips. And the quarter pipe itself will be Flowform or constructed of formed concrete. There will also be wall rides built into a few key berms within the pump track. Around the perimeter will be a family/beginner skills trail consisting of lots of Flowform features including bridges, rainbows, sunsets and plenty of dirt rollers and tabletops. Youth and beginner riders will be able to practice their skills here and work their way up to riding the pump track. 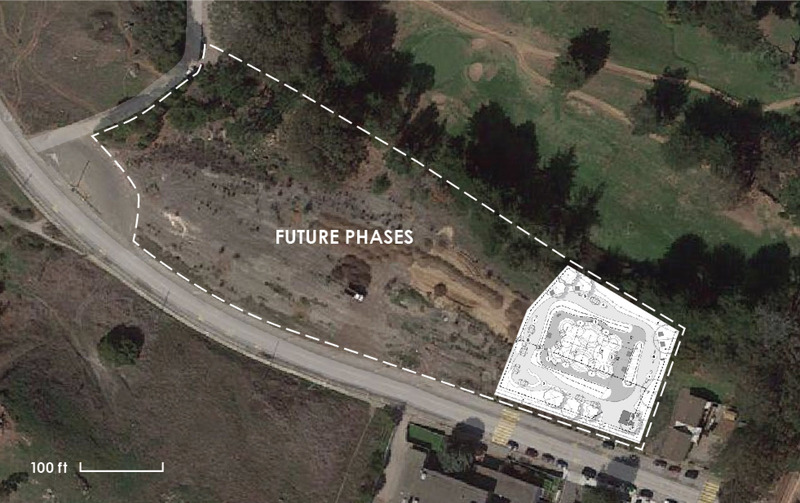 Native and drought-tolerant planting will be incorporated around the bike park features to create a family-friendly park experience that blends into McLaren Park and gently manages storm water. Once Phase 1 is completed, it will become shining example of what’s possible for the rest of the site. 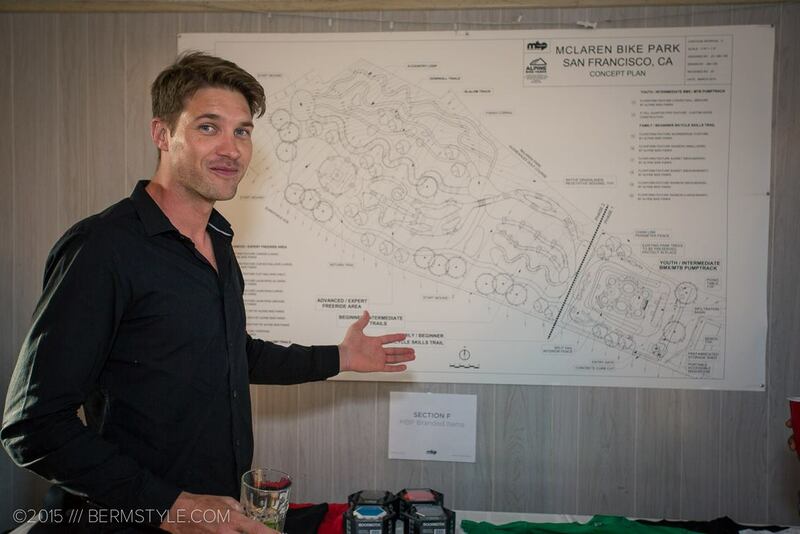 The hope is that funding of the remaining phases of McLaren Bike Park should go much quicker as a result of the desire for more advanced features, like the planned expert pump track, progressive and pro dirt jumps, slopestyle course, slalom and short track downhill courses, XC trails, cyclocross features… and much more. Once the remaining phases are completed, phase 1 will remain as the beginner area of the bike park. To help close our fundraising gap, and generate the remaining funds for design, I reached out to an old friend and previous member of SF Urban Riders, Will Aldrich. Will is very connected in the start-up community and no stranger to fundraising. Will immediately brought new energy to the project and a wealth of new donors. In February, we announced our first fundraising event. The first annual MBP DIG. April 16, 2015. Over the next month, we gathered donations from bike companies and other relevant brands for our Silent Auction. We received everything from a complete Intense Cycles Carbine 275 to Stance Socks, Rumpl Blankets, bike apparel, premium Giants Tickets, and much, much more. We promoted the event heavily on Facebook and Instagram. We kicked off the event with a silent auction with tons of great merchandise from donors in the bike industry, San Francisco based companies, local businesses, photographers and even some donations from individual cyclists that wanted to support the cause. Upstairs, the Silent auction quickly filled up with the near sold-out crowd of over 150 attendees. After drinks, appetizers, bidding and lots of socializing, MBP supporters headed down to the dining hall for Dinner. 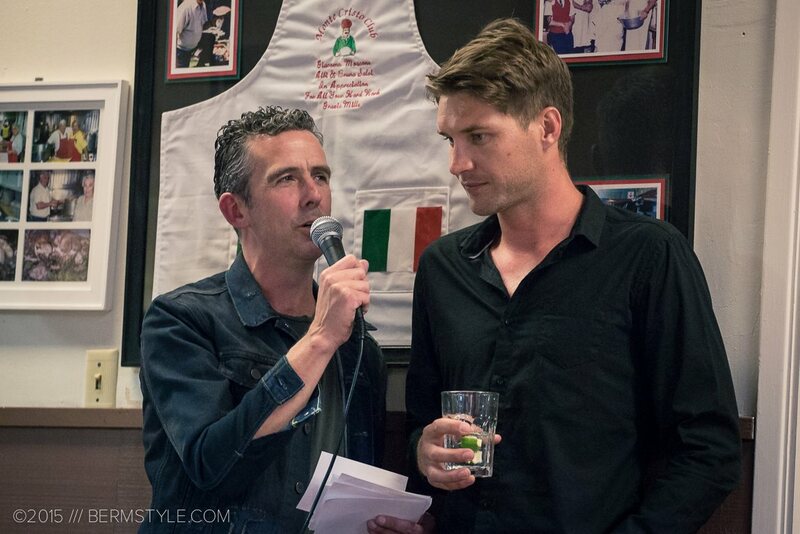 Shortly after the start of dinner, Irish Greg from KFOG’s morning show welcomed guests and turned over the mic to me, Dustin Smith, Chair of the MBP Founders. I gave an emotional acknowledgement to the outpouring of support to the cause and the energetic crowd in attendance. Lisa Bransten from SF Rec and Park was invited up to say a few words and reiterated the commitment from SFRPD to make MBP a reality. Will Aldrich, MBP Founders Co-Chair graciously thanked everyone for their donations and attendance, and made it clear that this bike park is for the kids of San Francisco. The neighborhoods surrounding McLaren Park have the most kids in the city, and many that are at-risk. MBP would serve as a positive outlet for these kids… A place for exercise, mentorship, growth, and FUN! Will and I welcomed Greg Minnaar to the event and up to the stage for the highlight of the evening: A little Greg vs. Greg. Irish Greg just happens to be a “Roadie” and For those of you who don’t know, Greg Minnaar is the three time UCI Downhill Mountain Bike World Champion. The type of riding they do couldn’t be more different. Questions were written submitted by the crowd earlier. In addition to the Q & A, the two Gregs took bike-related jabs at one another causing laughs and whistles from the crowd. A few personal questions made it into the mix. After dinner, everyone headed back up to check out the MBP Plans and make their final bids on silent auction items. The night wrapped up with the live auction and a signed warriors ball. When it was all said and done, we’d raised over $25,000 and gathered a load of good vibes for MBP. In 2012, we secured our location and won two grants totaling $500,000: The Community Opportunity Fund Grant for $250,000 and the Land and Water Conservation Fund Grant for another $250,000. But, while pushing Phase 1 through approvals and getting official estimates, we came to a construction estimate of $934,000. Consequently, we went through a process of “Value Engineering” to bring our design and our funds in line. We removed a few features, cut some fat, narrowed our construction time and ultimately landed on a budget of just under $885,000. Along the same timeline, we worked to raise funds to bridge a $385,000 gap between the construction estimate and our funding. To bring our funds and our budget together, the MBP Founders team worked with SFRPD to secure $300,000 in McLaren Park Quick Strike funding through the 2012 Parks Bond. SFRPD secured a Jumping Fences grant for $25,000. Supervisor John Avalos’s office also came through in a big way with a contribution of $30,000 in 2015, and another $50,000 allocated in the 2016 City Budget. Boom! Construction funding complete! To keep the design in the hands of the people and professional bike park builders, we looked to the community for support and had created the MBP Founders. Supporters and Founders of MBP stepped up and helped the project continue to move forward. Designing for phase 1 was a learning process for all involved. As we worked through the city’s processes, we realized our total design costs will be just over $160,000. This not only includes bike park design from Alpine Bike Parks, but landscape architecture, engineering, storm water management, permits, grading plans, and lots of other necessary details. The good news is that design is fully funded. With construction and design fully funded, we could move into construction documents and set a course for construction! On June 1st, Our partners in Planning and Fundraising at SFRPD presented the 60% Design plans and Donor Recognition plan to the SFRPD Commission Capital Committee. Will Aldrich and I attended the meeting and gave supportive remarks as did Matthew Blain from SFUR. Theresa Zaro, our landscape architect presented the current MBP design. The Capital Committee voted unanimously to put the design on the “consent agenda” for the June 16 meeting of the full Recreation & Parks Commission. As of June 2016, we’re refining our 90% CD’s (Construction Documents) submittal to SFRPD and the city of San Francisco. The Phase 2 concept design is well under way, and once Phase 1 is up and running, the need for a bigger park will quickly become evident. There will still be a great deal of money to raise to make Phase 2 a reality. To support the project, please check out the donation opportunities available through the MBP Founders. More info can be found at mclarenbikepark.com.